The MAIN STAGE at the METRO Music Fest is being moved to The Criterion, 500 E Sheridan Avenue, Oklahoma City, Oklahoma 73104, Friday, April 6th. Problems with the video, click here. It’s impossible to separate a university and its community. They are connected by vision, by need, by goals. Together, they thrive. 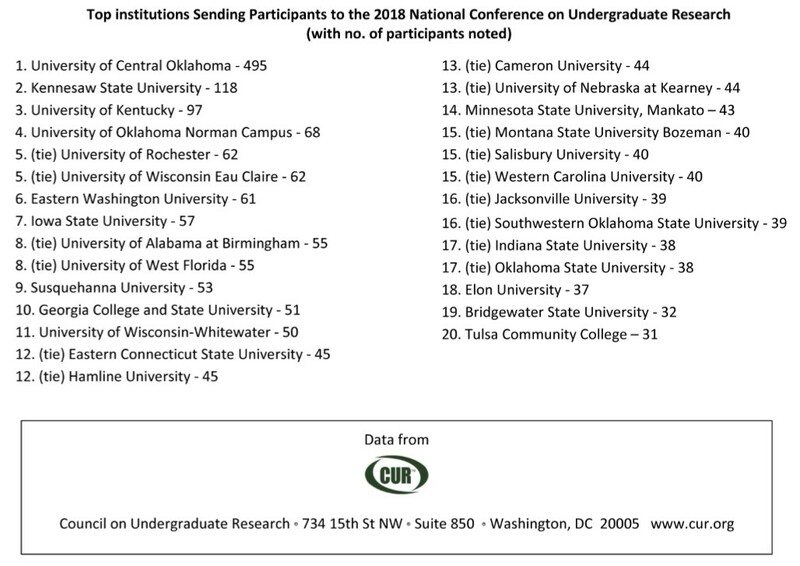 The National Conference on Undergraduate Research 2018 embraces this vital relationship in the conference theme, Connection to Place, recognizing the increasing need for direct relevance of an educational experience to the communities that await the college graduate in 2018 and beyond. The University of Central Oklahoma warmly invites you to our place to make connections with innovative undergraduate research, new friends, and new places to broaden your perspective. We call the growing Oklahoma City metro home, where opportunity is as wide open as the plains on which this great city was built. On campus, you’ll encounter a welcoming community surrounded by restaurants, shopping and entertainment in Edmond, Oklahoma’s charming downtown. Just a few minutes away, you can explore Oklahoma’s Native American roots and cowboy heritage. Find adventure at the Oklahoma City Boathouse district, an official U.S. Olympic and Paralympic training site and home to UCO’s CHK|Central Boathouse. Experience downtown OKC’s thriving culture and cuisine scene. Find your Connection to Place at NCUR 2018! The University of Central Oklahoma is dedicated to educating creative, collaborative graduates who are adaptable and engaged critical thinkers, who are receptive to new ideas, who celebrate the diversity, and who will live fulfilling lives. By supporting and celebrating diversity in areas including race, class, gender, ethnicity, culture, religion, ableness, sexual and affectional orientation, gender expression, and other aspects of self-identification, the university expands the social and conceptual horizons both of students and of faculty and staff members, and it contributes to the intellectual, cultural, economic, and social advancement of the communities it serves. Both CUR and the University of Central Oklahoma, this year's host for the NCUR, pledge that the 2018 conference will provide a welcoming, safe, and inclusive environment for all students and other participants. Full refunds, less a $50 cancellation fee for attendee registration will be honored for all cancellations received, in writing, by March 9, 2018. No refunds will be given after the cancellation deadline. Send cancellations to ncur2018@uco.edu. Transfer of registration to another individual before the cancellation deadline is free of charge, but subject to member classification charges due to differences in conference rates. Transfer of registration after the cancellation deadline will be charged a $50.00 transfer fee. If you fail to cancel your registration by March 9, 2018, and/or are a no show to the event, you are responsible for payment in full. The National Conference on Undergraduate Research 2018 cancellation fee represents the cost in time, labor, supplies, postage, etc., expended in registering and deregistering an individual. Because the cancellation fee represents work performed by the staff associated with the event, it is the conference's policy to assess the fee in all cases. CUR always suggests that their registrants purchase low-cost travel insurance when booking their air reservations. Not only may this insurance cover your airfare in the event of cancellation but may also cover the registration cost for the meeting you were to attend. Neither the University of Central Oklahoma or the Council on Undergraduate Research can guarantee what is covered by travel insurance. You must carefully review any travel insurance policy that you purchase to determine what aspects of your travel will be covered.